Dr. Gibbons is a 1974 graduate of Thomas Jefferson Medical School and is Board Certified in Internal and Geriatric Medicine. Dr. Gibbons established MCMA in 1977 as a practice specializing in primary care and managing the critical care needs of the hospitalized patient. As a dedicated and caring physician for over 35 years, he is committed to the health and well-being of his patients. Dr. Gibbons also devoted his time and talents for many years to the growth and development of the Holy Redeemer Health System serving as the Chairman of the Department of Medicine. Dr. McElwain is a 1976 graduate of Thomas Jefferson Medical School where he served as an Assistant Medical Professor and continues to play an active teaching role with medical students and residents. Dr. McElwain has served as President of the Medical Staff and is currently the chief of Division of Internal Medicine as well as a member of the board of trustees of Holy Redeemer Hospital. Dr. McElwain is Board Certified in internal medicine and his interest is in preventative medicine. His counseling and teaching skills are evident in the caring way he instructs and informs his patients in the management of their health. Dr. McElwain joined Dr. Gibbons in 1983. Philadelphia Magazine has recognized Dr. McElwain as one of their Top Doctors in Internal Medicine for 2018. Dr. Galluzzo is a graduate of MCP-Hanehmann University, completing his internship and residency in internal medicine at Thomas Jefferson Hospital in Philadelphia. Dr. Galluzzo is Board Certified in Internal Medicine and strives to provide quality, compassionate care to every patient he encounters. He joined MCMA in 2004. Dr. Galluzzo’s professional interests lie in prevention and wellness along with the management of chronic diseases that affect young adults through geriatric patients. Dr. John is a 2009 graduate of Drexel University College of Medicine (formerly MCP-Hahnemann University) in Philadelphia. She was accepted to Drexel University College of Medicine from high school, and attended Rosemont College through their early assurance direct pre-medical program. Dr. John graduated with a degree in biochemistry from Rosemont College in 2005 and proceeded to medical school. She completed her internship and residency in 2012 at Montefiore Medical Center (Albert Einstein College of Medicine University Hospital) in Bronx, NY. She is Board Certified in Internal Medicine and has a keen interest in challenging medical problems affecting diverse ethnic populations. Dr. John joined MCMA in 2012. Dr. Butler was born and raised in the Philadelphia area. He received a BS in Biology, graduating from Albright College with honors in 1989. Dr. Butler attended Jefferson Medical College received his M.D. degree and joined MCMA as full-time physician in 1996. Dr. Butler manages his patients in both the hospital and office settings in addition to being Board Certified in Internal Medicine, Hospice and Palliative Care. He has served as Medical Director for Holy Redeemer Hospice for over 10 years. Dr. Litt graduated from Thomas Jefferson Medical School in 1993 and continued at Thomas Jefferson Hospital for his internship and residency program. Dr. Litt takes an interest in a broad range of medical issues ranging from preventative healthcare to the diagnosis and treatment of more complicated diseases in the young and elderly. Joining MCMA in 1996, Dr. Litt seeks to take an active role in the comprehensive care of his patients. Philadelphia Magazine has recognized Dr. Litt as one of their Top Doctors in Internal Medicine for 2018. Barbara Holdren has been in the medical field since 1976 and joined MCMA in 1993. She received her Nursing Diploma from Frankford Hospital School of Nursing and received her Bachelors Degree in Nursing from Penn State University. Barbara then continued her education obtaining a Master’s Degree in nursing with certification as a Family Nurse Practitioner from the University of Pennsylvania. Beginning in 2011, Barbara began her Doctoral degree in Nursing Practice at Drexel University and presently holds a degree of DrNP. This degree will enhance practice by not only allowing the N.P. to treat and diagnose illness but to better understand the nuances of someone’s behavior. Barbara recently completed a study concerning the treatment of diabetes. This investigative study will discover for the diabetic the need for problem solving tactics or more appropriate social support. Once determined, an intervention will be implemented to improve diabetic outcomes. Julianne Rutz, has been a part of the Holy Redeemer Health system since February of 2000. She worked as a Certified Nurse’s Assistant (CNA) at Lafayette-Redeemer Retirement & Nursing Home while attending classes for her Bachelor’s Degree. Julianne received her BSN from Holy Family University in 2004 and worked as an Intensive Care Unit nurse for over 13 years. She received her MSN from Walden University in 2017 with a focus on Adult Gerontology and Acute Care and was awarded National Honors from the Sigma Theta Tau International Honor Society. 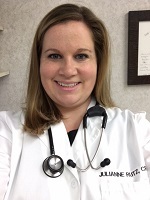 Julianne is Board Certified through the American Association of Critical Care Nurses and is a member of the Pennsylvania Coalition of Nurse Practitioners and the American Association of Nurse Practitioners. Her focus is on disease prevention and wellness, as well as management of chronic illness. She has a specific interest in patient centered care and the involvement of patients in the decision making for the management of their chronic diseases. Heidi Wright has over twenty years of experience as a Nurse Practitioner and more than thirty years of experience as a registered nurse. She is a graduate of Thomas Jefferson University Hospital’s Diploma Nursing program and holds undergraduate and graduate degrees from Gwynedd Mercy University. She was awarded her Doctor of Nursing Practice from Gwynedd Mercy in 2016. Heidi is Board Certified as an Adult Health Care Nurse Practitioner through the American Nurses Credentialing Center (ANCC). Having a special interest in the elderly and chronic care, Heidi holds a second Masters of Science in Nursing with a focus on Gerontology and is on the medical staff of Holy Redeemer Hospital, St. Joseph’s Manor, and Lafayette-Redeemer Nursing Homes. Heidi joined MCMA in 1996 and is a member of Sigma Theta Tau International, American Association of Nurse Practitioners, Pennsylvania Coalition of Nurse Practitioners and the American College of Physicians. A Nurse Practitioner is a Registered Nurse (RN) who has advanced education and clinical training in a health care specialty area. Nurse Practitioners work with people of all ages and their families, providing the information patients need to make informed decision about their health care and lifestyle choices. Obtain medical history and perform physical examinations. Diagnose and treat common health problems such as infections, minor injuries, diabetes and hypertension. Provide women’s health care including routine PAP screening and breast exam. Provide annual physicals and maintenance care for adults, including positive health behaviors, self-care skills, education and counseling. Collaborate with the physicians in order to promote health maintenance. Copyright © 2019 Montgomery County Medical Associates.